When it comes to GNSS market intelligence and insight, the GSAâ€™s GNSS Market Report sets the standard. 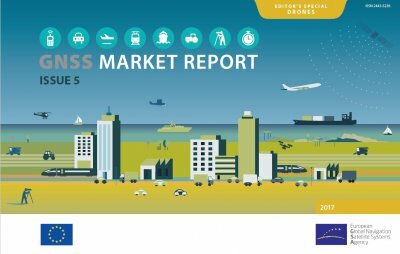 Regularly referenced by policy-makers and business leaders around the world, the publication has earned its reputation as the go-to resource for an in-depth look at GNSS market opportunities and trends across an array of essential market segments. In the fast evolving world of satellite navigation technology and GNSS applications, monitoring the landscape and having the latest information is essential. With its in-depth look at market opportunities and trends across eight market segments, the GSAâ€™s 2017 GNSS Market Report is a key resource for successfully navigating this exciting market. Building on the success of the previous issue, the 5th Issue of the GNSS Market Report was be launched during the European Navigation Conference (ENC) in Lausanne, Switzerland in May. In addition to providing a thorough analysis per market segment (Location-Based Services, Road Transportation, Aviation, Maritime, Rail, Agriculture, Surveying and Timing & Synchronisation), region and application type, this edition will feature new elements as: IoT, Smart Cities and Big Data, demands of GNSS users, added-value of GNSS to each segments and the role of GNSS in the market of drones. CEETTAR and GSA have worked together to develop the chapter on Agriculture, having as a result that contractors are shown as frequent users of new technologies. This collaboration is an intermediate step for having more important activities. The Agriculture-chapter can be accessed on the following link. The full 100-page report, including an editorial special on drones, is available here.